Walt Disney was a very forward-thinking individual. Historians have called him “a man ahead of his times”. When he planned his “Florida Project”, Epcot was going to be the center of everything, where residents lived in a community always on the edge of tomorrow. One particular aspect was transportation. Walt wanted a convenient way to provide mass transit around his Experimental Prototype Community of Tomorrow. Unfortunately, Walt died before he could see this project through to the end. Still, today Disney World uses many of his ideas around the parks and resorts. One of those is Tomorrowland’s PeopleMover in the Magic Kingdom. Here are 10 Amazing Facts about Tomorrowland’s PeopleMover. 1)	Queue – One of the best things about The PeopleMover is that it rarely has a long line. Even when it does, keep in mind this attraction is a “constant loader”, a theme park term meaning the ride never stops and guests are constantly loading the ride vehicle. Therefore, the line moves quickly. 2)	What’s in a name? – The PeopleMover was formerly known as the WEDWay PeopleMover (WED is short for Walter Elias Disney) from 1975 until 1994 and the Tomorrowland Transit Authority from 1994 until 2010. 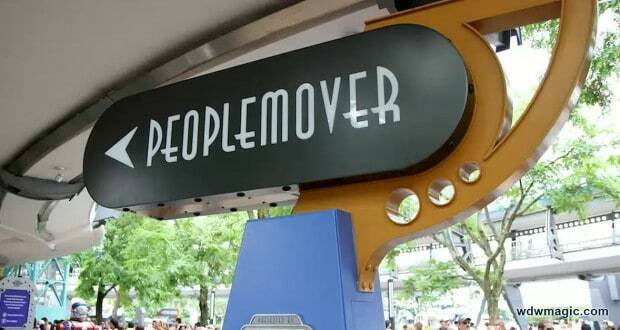 In 2010, the name was changed back to the combined Tomorrowland Transit Authority PeopleMover. Traditionalists will refer to it as simply PeopleMover. 3)	Into the future! – Themed as an urban mass transit system of the future, the ride takes passengers on a tour around the second floor of many attractions in Tomorrowland. People Mover is a great way to take a tour of Tomorrowland and all its attractions. If you’re lucky, you might even see Space Mountain with the lights on. Because the two attractions have separate operating systems, the TTA does not close if Space Mountain breaks down, so guests riding the TTA when the work lights are on can get a rare illuminated look at the layout for the track. That will blow your mind! 4)	Ride description – The Tomorrowland Transit Authority PeopleMover is a slow-moving 10-minute ride in a vehicle that is propelled by a system of Linear Synchronous Motors embedded in the track. It has one station, in the center of Rocket Tower Plaza, located beneath the Astro Orbiter attraction. The Peoplemover’s leisurely pace, fast-loading queue, and the sneak previews it offers of other more extreme Tomorrowland attractions, make it a favorite attraction among veteran Disney guests. 5)	Progress City – One of the most interesting sights you will see is a large diorama containing a portion of the model for Walt’s Progress City, or E.P.C.O.T. The model originally resided in the upper level of the Carousel of Progress at Disneyland in 1967. 6)	Parents beware! – The PeopleMover passes a window looking downward at Mickey’s Star Traders gift shop. Your kids will definitely want to return there for some souvenir shopping! *Bonus tip: Be aware that there are brief periods of almost total darkness as the vehicles pass through tunnels. 7)	Opening Day – The WEDWay PeopleMover opened on July 1, 1975, based on the PeopleMover attraction at Disneyland. Because it did not utilize the propulsion system of rotating Goodyear tires used in the original, Goodyear opted not to sponsor the east coast version. The Edison Electric Institute was the original sponsor of the ride. 9)	Brand New – On October 2, 2009, the Tomorrowland Transit Authority received a new narration including segments introducing all attractions in Tomorrowland, including Stitch’s Great Escape! and Monsters Inc. Laugh Floor. The narration also includes brief audio clips from characters represented by the various attractions (for example Stitch and Roz, from Monsters Inc.). The PeopleMover name was revived in the new narration, which refers to the attraction vehicle as the “Tomorrowland Transit Authority PeopleMover,” in place of the previous “TTA Metroliner” name introduced after the attraction’s 1994 refurbishment. 10)	Mr. Morrow – Pay special attention to the paging system in the ride. “Paging Mr. Morrow, Mr. Tom Morrow!” Get it? Jimmie is a retired school teacher from Texas, who has been going to Disney World for 25 years. He has experience in taking large groups to Disney, in addition to taking his own children and grandchildren. Jimmie and his wife Rhonda make annual trips to Disney World, Disneyland, and sail on the Disney Cruise Line.